Not quite One Less Car, but close. 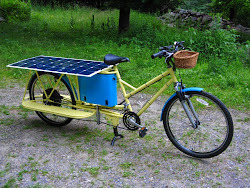 A bike that makes doing 50 mile long errands easier, and gets some of it's power from the sun. 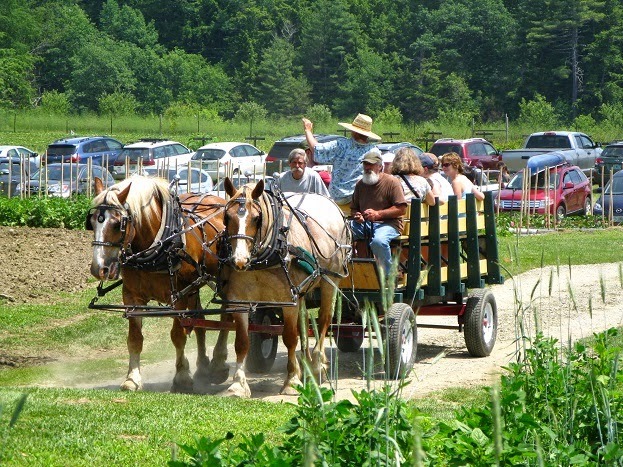 On June 29, Cedar Circle organic farm held it's annual Strawberry Festival. 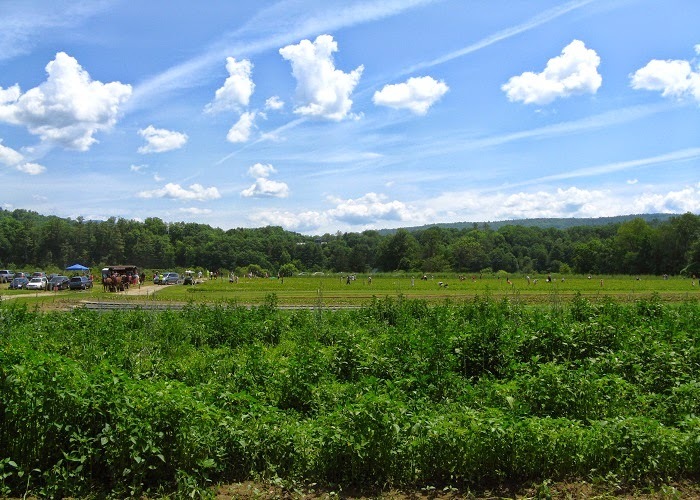 The farm is managed by Will Allen, (author of The War on Bugs) and Kate Duesterberg, who had put in a large roof top solar array on one of their barns several years ago, and are now arranging a community array along the Ag fields on the northern border in a buffer zone that cannot be farmed organically. 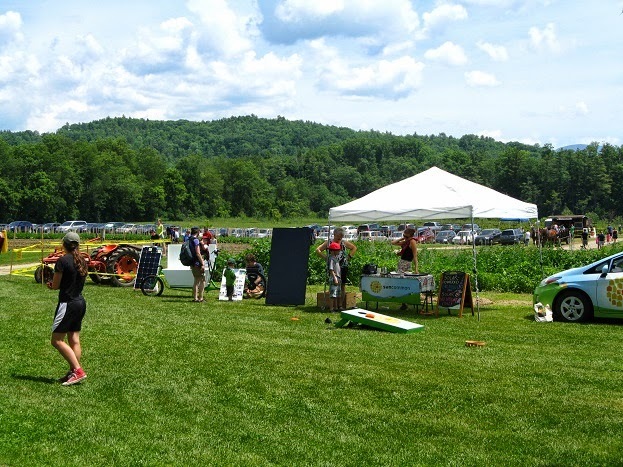 tents, music, and food were behind me in the farm buildings up the hill. 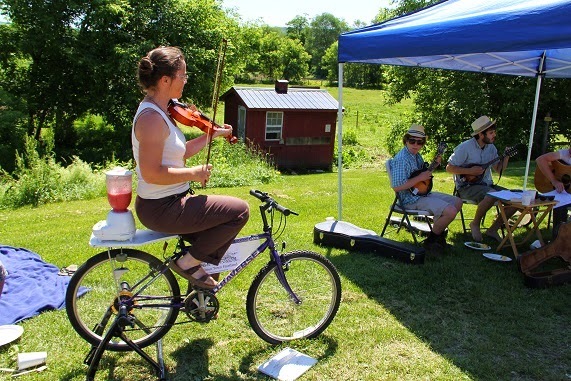 Berry Brunch in the Fields event while making a bicycle smoothie. 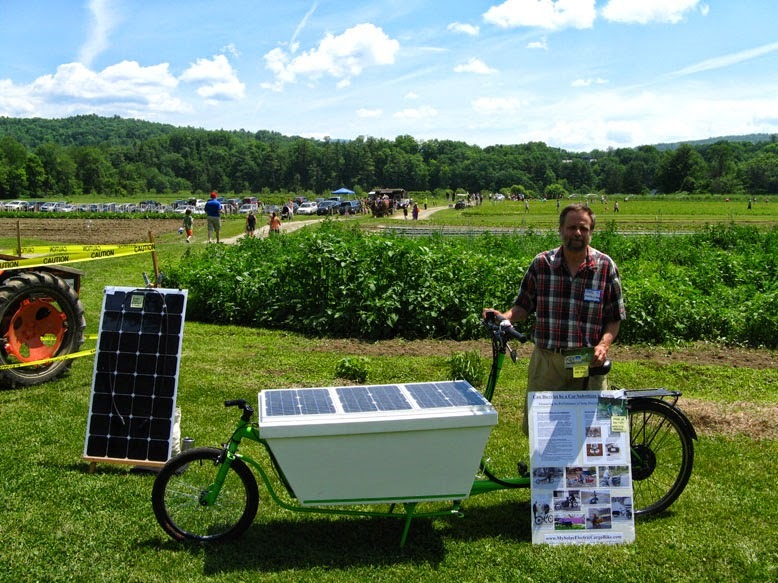 between the farm's electric tractor and Sun Common's booth. 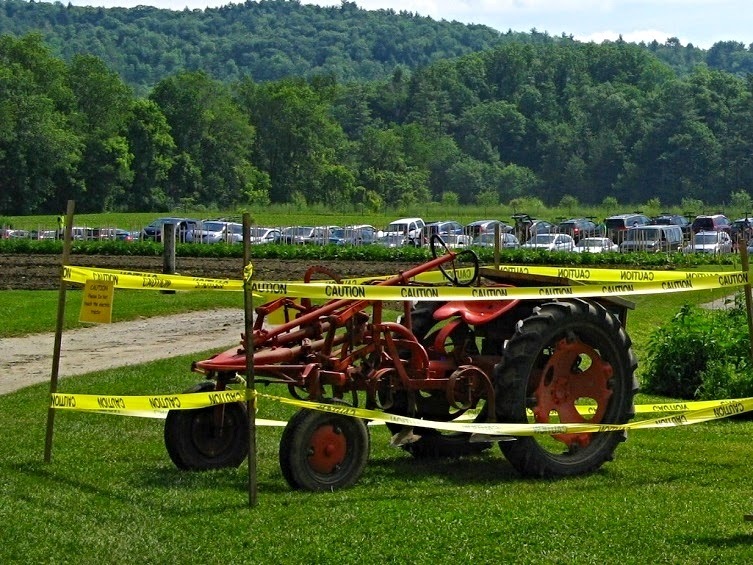 Cedar Circle converted an old Allis Chalmers model G to electricity by replacing the gas engine with an electric motor. It's turned out much nicer for the field crew planting and working alongside the tractor. A problem has been the lead acid batteries. I've read several times that lead acid batteries do not work well in an electric bike, simply because if they are discharged below half full the plates become sulfated quickly and ruin the battery. 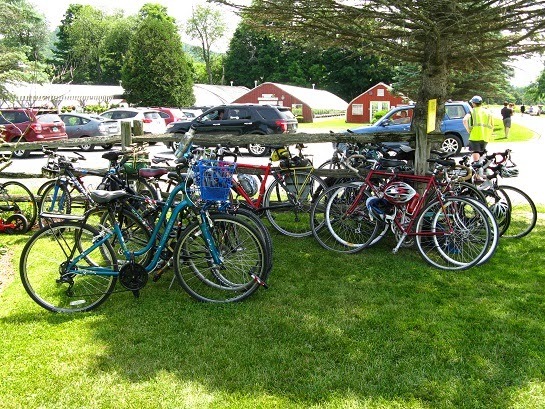 Most people cannot stop using an eBike assist during a ride as long as the batteries have any charge left, with the result that generally lead acid batteries do not last a year. After the festival we talked for awhile about the benefits of using lithium batteries (which can be drained almost to empty), and adding a few solar panels to the battery box cover. 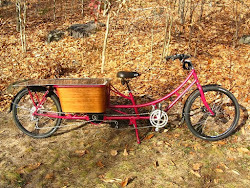 I brought up the Bakfiets, along with the new glassless, frameless solar panel and some pictures of the Longtail. It turned out to be a very cosmopolitan crowd, with 2 separate people telling me they had owned a Bakfiets (one in California, one in Amsterdam), and another young family who said that their Bakfiets was in storage in Chicago at the moment, awaiting shipment to Hanover. They had been using it in Portland, Oregon on relatively flat terrain, and we talked about the process of adding an electric drive to make it more usable in this area. Unfortunately there were no test rides, as there were too many people (1400) and little kids were running everywhere, I also had my picture taken with 3 high school students from NYC! They were looking for environmental projects to write about for a science class report. 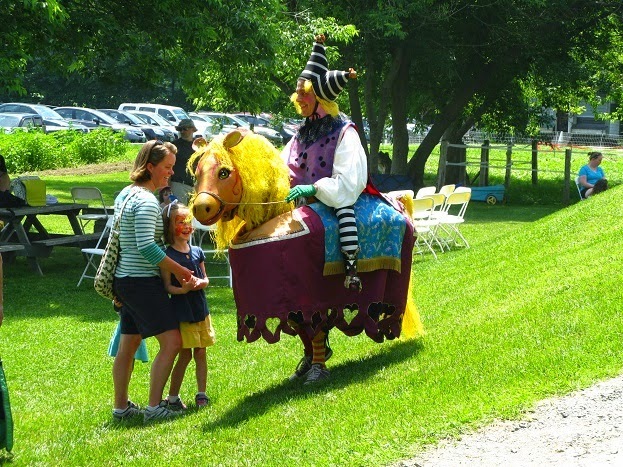 A local theater group also had horses that the kids could get close to. will grow greatly in the next few years. "This Bike Climbed Mt Washington"
I'm trying to write both more technical posts about these bikes, and more general posts about using work bicycles overall, so it is a mix. If you have a specific question send me an email and I'll write about it sooner. Maybe sports cycling isn't all there is? And you know the bike is dangerous?